Are you hoping to form the right kind of business relationships in the Middle East? This Turkey email list can be a great start. It contains valuable contact data of Turkish businesses and professionals with all of the information you need to network with great leads. Easily build connections with Turks using our Turkey email database, which can help you reach across boundaries and start to build your business in one of the Middle East's most prosperous countries. When you're trying to grow your reach across the miles, having the right lead list of qualified B2B contacts is the most important first step. Bookyourdata.com is where to buy email lists; we take the stress out of the lead-generation process so that you can start marketing right away. By consolidating Turkish business contacts into one bulk email list, we've gathered all of the tools you need to build B2B connections and make deals together into one place. Turkey emails, phone numbers, postal addresses, and detailed contact information are all here. You just need to buy and download it, and then you can use this one resource as a Turkey mailing list, call directory, or email list all at once. This is a bulk, ready-made list of Turkey contacts. Note that if you want to narrow your search even further, you can do that with our list-builder tool. 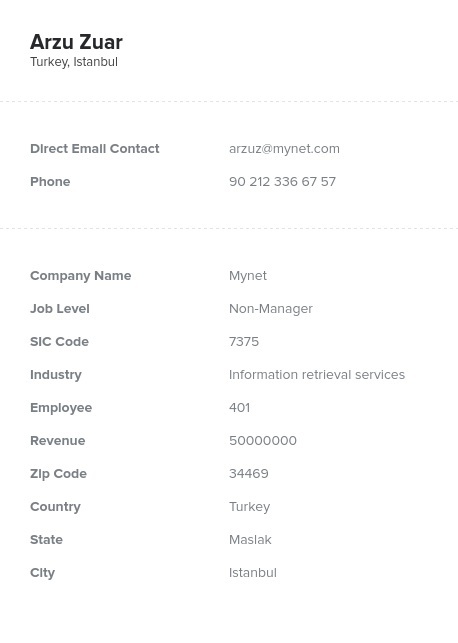 Use it to build a custom email list of Turkish businesses. For instance, you can focus on important industries like traditional agriculture and banking. Buy this bulk business database or build your own Turkey contact list today!